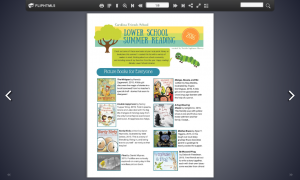 At the end of this school year, like many of you, I compiled a summer reading list for my Lower School students and an annual report for their families. Though this is something that I have been doing for the past six years, I’m always reinventing how it’s done so that it’s most effective for my current community. To that end, I believe design matters. For my summer reading lists, I have previously used Goodreads, in-text blog posts, and shared Google Docs – nothing too fancy or elaborate but what was simply needed to deliver the message. 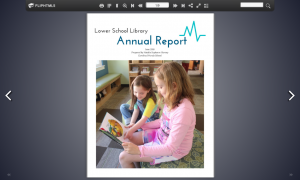 For the annual reports, I’ve exclusively used Pages, either modifying templates or creating my own design. Last year, I designed my summer reading list in Pages to look more like a magazine, something like the BookPage or the The Horn Book‘s publications, something more visually appealing. For this year’s summer reading list, I knew that I could essentially use last year’s template and just change the books. Nothing about the design really needed to be updated. But I challenged myself, used a new-to-me tool, and changed the look of it because I want to grow in the same way I teach my students – as a creator and designer and someone who thinks intentionally about audience and purpose. I think that we, collectively, look for and appreciate well-designed media. Free tools like Canva help amateurs like me design something beautiful and professional. Honestly, I wish I had known about it sooner. Though it’s been around a few years, I hadn’t heard of it until recently – but I had seen many examples of banners and flyers created with it. Before this turns into too much of a Canva commercial (no, they’re not paying me), I will say that there are probably many other similar design tools out there. This is just the one that I decided to try out! Because I wanted my products to look like a magazine, I also tried out FlipHTML5 to create the flipping pages. Though I’m particularly happy with these two promotional products, I know that next year, I will be trying something new yet again. I have yet to brand myself like some libraries and librarians, and I don’t know if that will be my next step. I enjoy the freedom to be creative in whatever way inspires me and connects with my audience at the time. As a side-note, I appreciate that this is also a way for me to grow as a technology leader in my school, to try out new tools and be able to knowledgeably recommend them to students and teachers. For these two products, I learned how to use Canva for the design and FlipHTML5 for the delivery. and so I’m inundated with books! Each year, I make the attempt to read all the books on the summer reading lists and all new books being taught in English courses over the next year. I also get distracted with my own reading and recommendations from friends. So while it’s an admirable goal, it’s one I’m as happy to have “in progress” as complete. Each school does summer reading a little bit differently. In our school, there’s one community book that everyone reads (1), 14 sponsored books, of which students choose one (15), and four professional books of which faculty choose one (20). One of the reasons that I enjoy doing this is that it leads to authentic (ie. not “small talky”) conversations with all students and teachers in August. It’s a shared experience, and you can always glean something from a book, even when it isn’t a book you’d choose yourself. Which leads to the other reason that I enjoy this. I am exposed to a variety of books I might not otherwise read, and there is a deadline that motivates me to read them. “The outpouring of ideas is central to The Circle, as it is in part a novel of ideas. What sort of ideas? Ideas about the social construction and deconstruction of privacy, and about the increasing corporate ownership of privacy, and about the effects such ownership may have on the nature of Western democracy. Dissemination of information is power, as the old yellow-journalism newspaper proprietors knew so well. What is withheld can be as potent as what is disclosed, and who can lie publicly and get away with it is determined by gatekeepers: thus, in the Internet age, code-owners have the keys to the kingdom. Turns out, the teacher in question was not familiar with Atwood’s critique but had read one by Ellen Ullman three weeks prior in the New York Times Book Review. Ullman’s conclusion about the book’s literary merit is radically different from Atwood’s. After reading the book, I began to question further these competing claims. Consider these excerpts. Booklist Starred: Eggers brilliantly depicts the Internet binges, torrents of information, and endless loops of feedback that increasingly characterize modern life. But perhaps most chilling of all is his notion that our ultimate undoing could be something so petty as our desperate desire for affirmation. Kirkus Reviews: Eggers thoughtfully captured the alienation new technologies create in his previous novel, A Hologram for the King, but this lecture in novel form is flat-footed and simplistic. Though Eggers strives for a portentous, Orwellian tone, this book mostly feels scolding, a Kurt Vonnegut novel rewritten by the Electronic Frontier Foundation. If you can’t tell, I’m partially writing this post because I can’t wait until August and so desperately want to discuss the book with someone. If you’re read it or have thoughts on the subject of technology and privacy, I’d love to hear it in the comments below!